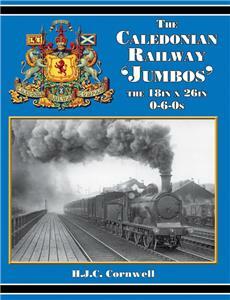 This is a detailed study of the Caledonian Railway’s ‘Jumbo’ 0-6-0s, officially the ‘18in x 26in x 5ft 0in Goods Engine’, which were not only the workhorses of the Company but also formed the largest class of locomotives in Scotland. The 244 members of the class were built over a fourteen year period between 1883 and 1897, and many were also Westinghouse braked, whilst some were vacuum fitted as well, which thus allowed their extensive use on passenger traffic too. With the aid of official plans and drawings, along with numerous mostly previously unpublished photographs, and in conjunction with technical specifications and other data, the author has faithfully documented the history, work, performance and allocations of these iconic little engines for posterity. The entire class was taken over by the LM&SR at Grouping and most of them survived into the BR era, with the last four only being withdrawn in 1963, giving the ‘Jumbo’s a history of 80 years in total.